Start your child's musical journey with Jacappella and watch them grow in confidence! Here at Jacappella everyone loves music! Our teachers are passionate about introducing children to music and setting them on a unique musical journey. Our parents love watching their children become budding musicians full of fun and confidence and our pupils love singing, dancing, clapping and tapping to our lively Jacappella songs. It is never too early to begin Jacappella music classes. Making music is such a powerful way of hard-wiring the brain to improve speech, reading, problem-solving skills and co-ordination. Come on a musical journey and share our Jacappella songs and games and watch your child "light up" through the weekly stimulation of our music classes. Join us on a Jacappella Musical Journey! If you love music, you'll love Jacappella! Every week, more children join Jacappella and benefit from our unique songs and activities. We believe all children are born with innate musical ability and all children benefit from early childhood musical involvement. The Jacappella dream is to make affordable music tuition available to as many children as we can. We want to share that dream with vibrant, enthusiastic individuals who are as passionate about music as we are. Whether you are a Day Nursery looking for a quality music course to add to your nursery curriculum or an individual looking for a new career that fits around family life, we would like to hear from you. We believe all children are born with musical ability so we've developed lively lessons built around musical games, puppets, instruments and songs you'll love, all designed to encourage your child's sense of rhythm and pitch and set them on a lifelong musical journey. Jacappella provide tailor made structured music courses for day nursery settings. The achievements the children make are easily linked to the Communication, Language and Literacy area of the "development matters" guidance from our Early Years Foundation Stage making the sessions so valuable. Kimberley Anne Anstess, Nursery Manager, Small World Day Nurseries. "At Nutkins we have been taking part in Jacappella for nearly 1 year. The children thoroughly enjoy the lessons and I can hear their lovely singing throughout the nursery! The children have learnt a lot in this year; new songs, how to play an instrument and how to take turns. If the children had it their ways we would be doing Jacappella every minute of every day!" Emma. Manager, Nutkins. "The training was fun and informative with lots of new songs and activities I know the children will love!" Jenny, Music Leader, Little Friends Day Nursery. 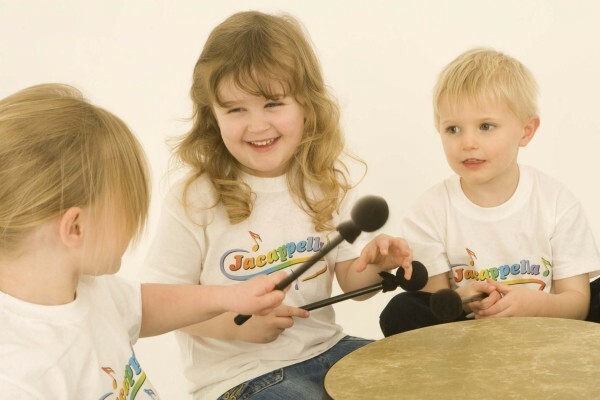 "Becoming a Jacappella Music Centre is a really fun way to help children develop their earliest musical talents" Owner, Little Friends Day Nursery.
" The lessons are going well. All children listen attentively and embrace each lesson with joy and excitement! " Julie, Director, Mereside Farm Day Nursery.